Silvia Li Sam, A storyteller at heart. Growing up, I didn’t get to see them that much because they would work 7 days a week, and on holidays too. I would always see my parents persevere through any obstacle. Not enough money to pay rent? Work harder. Not enough rice to cook a meal? Borrow from the neighbor, cook it, sell it to people, pay back the neighbor, and cook a meal with the rest of the money. They would find a way. I used to wonder how they had so much motivation even though things seemed to be falling apart. I didn’t say anything about how I felt, which I regret. I swallowed my fears and wanted my parents to feel proud. I grew up fiercely, desperately. My parents invested most of their money in our education so we went to private school in Peru. Most of the people in my class didn’t know, but I remember being jealous of them. I remember complaining and crying to my parents about how unfair everything was. They were spending weekends at the beach or traveling, while I was working. 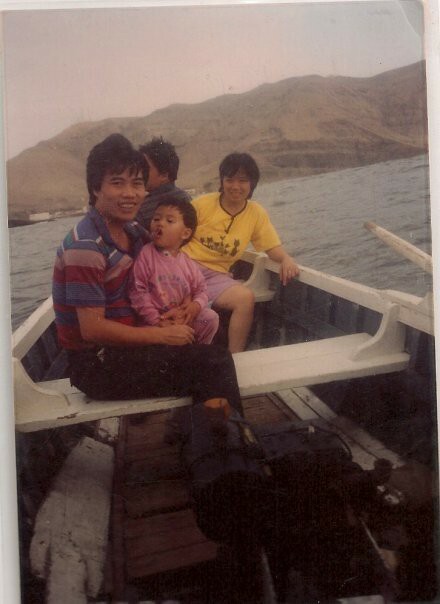 The desire to have a better life for their children motivated my parents to emigrate from their home in a rural Chinese village to Peru. Leaving behind their relatives, dreams and their country, they chose to dedicate their lives to long grueling days of physical labor in hopes to create a brighter future for their children. They took jobs that they did not necessarily enjoy, but with the idea of having their children getting an education. Things started getting better. We were financially more stable, but our lives, our conversations were always centered around work, our future, and money. I remember wanting to leave home. I remember almost hating them (I know, pretty bad). Why am I so unlucky?, I asked myself. This problem went on for years. They would question every decision I would make related to money. Even with financial stability, I was scared of telling them I went to eat out with friends, which of course, created insecurities and lack of trust. Everything was a mess. I was angry and stressed all the time. When I first moved out of home, I was almost 17, it hit me very hard to be faraway. I was very excited at first, but I got homesick quite fast. For the first time, I had what I always wanted: freedom. But I wasn’t happy. I was sad and realized I had never allowed myself to be sad. I had to be strong for everyone and I was so busy working and taking care of my sister that I never had the chance to release. No one talked about feelings in my family. I remember reading books about how other people dealt with the pain and met people in similar situations. They felt related and I could finally breathe after a couple of months. I was a whole new person. I was angry at my parents because they didn’t let me be a kid. I was jealous at my friends because they could spend time with their parents. I was angry at “money” for ripping my family apart. I was angry at myself. I realized that I used to be a pretty happy kid when I was 8. A lot of problems that came my way had made me an irritated person. When I learned to let go all these problems, I got a glimpse into what life could be like if I wasn’t so worried about money and making everyone happy. Recalling these events, after 4 years since I first moved out, make me realize that my childhood wasn’t as bad as I thought. My parents literally did the best they could with what they had. A lot of the negatives situations that occurred were created in my mind, on my own. But the difficulties we experience shape us, and when we decide to make peace with our past, that’s when our journey begin I believe. For me, having to work since I was little and seeing my parents do everything they could to make us happy in their way were very significant. I wasn’t aware of it then, but as I finish college in one month in a half, I look back and feel grateful for my childhood. They moved to Peru in their early 20s to a whole new country with no knowledge of the culture and language, around my age right now, and I can’t imagine what life would be if I’d move to a country where I don’t know anyone. But they managed to thrive, and I know they did the best they could with what they had. I often get the comment,“You are only twenty and you are so mature.” This is quite wrong and quite right. Throughout my short life, I have experienced many obstacles which have led me to be the person I am now, but there’s a lot I need to learn. Today, I am still discovering myself. At school, I’ve met people with different backgrounds, from one of the richest people in China to many first generation college students who are struggling to afford college. I still feel quite confused about my identity. Something I do know is that I am standing at a remarkable turning point in my life, a twenty year old about to graduate from USC. I believe strongly that as I continue this journey, I will be able to achieve goals even beyond my own expectations. Silvia is one of the few Peruvian Chinese immigrants working on the education problem in the United States. Because of her work with underserved youth in Los Angeles and experience with public schools in Peru, she has realized how similar both the American and Peruvian education systems are. She has spent the last year using her expertise in marketing to tackle the education problem in America. Silvia is a social media expert, storyteller, and viral marketer who has created marketing campaigns that have reached millions of people organically. She is the social media specialist at the XQ Institute, a national nonprofit committed to rethink American high schools, create new learning opportunities for young people and open up the possibilities of the wider world. Silvia joined the XQ Institute to combine powerful storytelling, social media, and design thinking to make education more accessible to every single person in this country. Prior to XQ, Silvia was a content marketer at Startup Grind, the largest independent startup publication in the world inspiring and connecting 1,000,000 entrepreneurs. She led and grew the largest Medium publication about technology from zero to now 250,000+ readers. The publication includes writers like a technologist, venture capitalist, and New York Times bestseller Steve Blank and Twitter’s co-founder Biz Stone. Silvia has been featured on Forbes, HuffPo, CBS, NBC, ABC, etc.